Buck Brook Farm was tucked away in the Catskill Mountains. The nearest town was North Branch and it was too far for a walk and, only having a church, was of no interest to our students anyway. While the students were dependent on we staff for a driver, it was not difficult to find one of us being up to an adventure like catching a movie. The campus did have vehicles available to us, and a motley assortment of vehicles it was! Being a commune, the staff brought whatever vehicle they possessed and made it available to one and all. So it was I found myself grinding the gears of an vintage GMC Scout stuffed wall to wall with six festive teens of every stripe. By wall to wall, I mean another staff member was in shotgun and the kids were facing one another, packed into the short bench seats that lined the Scout’s sides to maximize seating and cargo space. A door over the back bumper served to load riders and cargo. My fellow staff member kept busy wiping and scrapping and doing his best to keep the inside of the windshield clear, it being a sub-zero January afternoon and the confined Scout being filled with eight pairs of lungs pumping out plenty of potential frost. You bet I had the hubs engaged so we were powered on all wheels. You bet I knew brakes on ice are brakes on ice and it does not matter whether power is supplied to all wheels or not. And you bet I knew downshifting means there is more traction with all wheels turning under compression than having brakes locking the wheels. Even so, I was taking it plenty slow. Alas, these were the Catskill Mountains and the winding little roads feature plenty of up grades and down grades. The scout was heavy with eight of us. The road was covered with snow. Rounding a corner that looked like any other, the road immediately began a steep grade down a straight-of-way some thousand yards long. At the bottom of the grade the road made a sharp turn to the left and an abrupt hillside rose smack dab in our way. The hillside was topped by a cozy cottage, not that I was spending much time considering that! Tapping the brakes in desperation I turned into the corner and, at perhaps ten miles an hour, that Scout slid right off the side of the road and laid itself down on the deep snow that covered the hillside. My heart and my brain were swamped with regret at endangering the kids and letting them down on our adventure to a movie. Well, this was before seatbelts were standard much less required. The three students who had been on the Scout’s left bench were busy finding handholds so they could get off the students who had been on the right bench. The kids on the right bench were trying to avoid elbows and knees. And all six were scrambling to get out the back door. Getting out the door, the kids did not hesitate to jump into a game of let’s tip this thing up and get to the movie. We all lined up on the hill and tipped that Scout back on it’s wheels. I was so proud of those can-do kids. I have no idea what movie we went to see that night and I doubt anyone else does. We all might remember the adventure of the Scout laying down for a little nap. This entry was posted in Buck Brook Farm, Catskill Mountains, New York State and tagged Adventurous kids, Adventurous students, Double-clutch, GMC Scout, Green Valley School, North Branch NY, School, Scout, tipped over on May 15, 2018 by deansgreatwahoo. 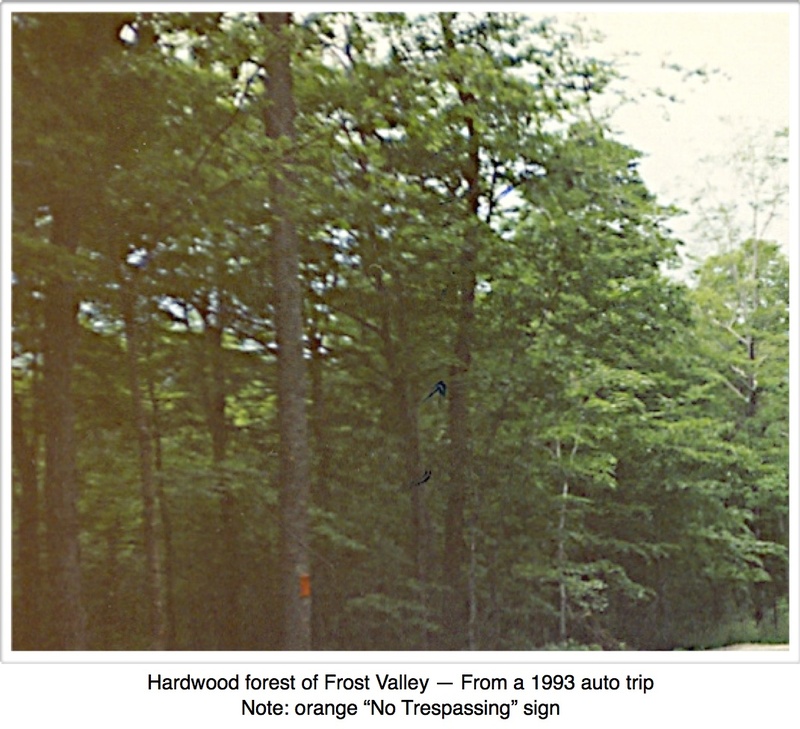 Frost Valley was named for a reason and a requirement for the private estate where I found myself being a handy man was two well-stocked woodpiles, one for the main house and one for the caretaker’s place. The caretaker, Stan, had been on the estate long enough to keep an eye out for promising firewood trees. Once the early rush to keep grass mown and weeds out of the garden began to settle down, the earth in the forests had firmed up enough to get the 4X4 GMC Scout into the woods with a trailer. So we found ourselves tossing a chain saw and pry bars onto the trailer and setting out into the woods on barely noticeable ruts being overlapped with the branches of hardwood forest. I figured we’d be searching for dying trees or gnarly old snags that would beautify the forest if removed, but Stan quickly set me straight. Perhaps such harvesting would beautify the forest, he agreed, but his job was to cut and split wood. And splitting gnarly snags and dying, unpredictable wood was a pain in the keester. Nope. He had his eye on the healthiest, straightest, most handsome trees in the forest—two or three he’d been eyeing for several years. And handsome they were. Perhaps Elms? No matter. They stood straight and strong, with no branches for a long way up the trunk. I ended up appreciating that last detail. It seemed a shame to me, chopping down such beautiful trees, but down they came. In a surprisingly short time the first load was cut into foot-long sections, just right for the estate’s stoves, and loaded on the trailer. We hauled them to the shed area of the estate’s main compound, dumped them on the ground, and went back for more. Getting out to lock the front hubs of the Scout left us squishing in our socks. The granny gear and the four wheel drive just meant four wheels were digging in rather than two. We cut our losses and walked back to the compound to get the tractor. Next came the splitting—whether the logs we had just harvested or the dried harvest from the year before I don’t remember. I do remember being taught how to split wood. First, to take the time to simply look at the cut end of each piece. Find the places it wants to be split. They are easy to find once you look for them—little cracks, usually around the edge, where the wood is already splitting. Then get the heavy maul high overhead and put most your effort into getting the sharp edge as close as you can to the little crack you’ve chosen. Yea, there is some effort put into the power to drive the maul through, but mostly gravity and the heavy steel will provide the oomph. Getting it where it will do the most good is what pops that wood open and sends two pieces clattering across the ground. There is, of course, one other secret to splitting wood, and it is the secret that will keep you from having to twist and pull your maul out of a piece of wood that didn’t split. While reading the wood check the sides of the log for knots, the places where branches once were. You can split wood with the knot coming out the left or right side of your split, but no matter where the little cracks are running, if you try to drive your maul through a knot you will be putting more work into extracting the steel than it takes to split a dozen logs that pop right apart. Trust me, I soon came to appreciate Stan’s insistence on trees that were straight and true and who’s branches (meaning strong knots) began way up the tree. I was not a very strong guy, but I am six foot four, so by the time that maul smacked into those hardwood logs there was plenty of travel in that steel. I got to where I could split wood with the best of them and was surprised at how quickly those trees were turned into cords of split wood. I can’t say as I’d want to make a living at it, but to this day I enjoy splitting wood. There is something very satisfying when the halves go flying several feet in two directions, as if the wood is glad to be liberated from itself. This entry was posted in Hitchhiking and tagged 4X4, cutting trees, Frost Valley, GMC Scout, knots, maul, mud, splitting wood, Stan, stuck in mud, woodpile on March 9, 2015 by deansgreatwahoo.